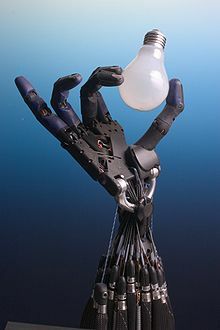 In computer science, artificial intelligence (AI), sometimes called machine intelligence, is intelligence demonstrated by machines, in contrast to the natural intelligence displayed by humans and animals. Computer science defines AI research as the study of "intelligent agents": any device that perceives its environment and takes actions that maximize its chance of successfully achieving its goals. Colloquially, the term "artificial intelligence" is used to describe machines that mimic "cognitive" functions that humans associate with other human minds, such as "learning" and "problem solving". As machines become increasingly capable, tasks considered to require "intelligence" are often removed from the definition of AI, a phenomenon known as the AI effect. A quip in Tesler's Theorem says "AI is whatever hasn't been done yet." For instance, optical character recognition is frequently excluded from things considered to be AI, having become a routine technology. Modern machine capabilities generally classified as AI include successfully understanding human speech, competing at the highest level in strategic game systems (such as chess and Go), autonomously operating cars, and intelligent routing in content delivery networks and military simulations. A simple Bayesian network. Rain influences whether the sprinkler is activated, and both rain and the sprinkler influence whether the grass is wet. A Bayesian network, Bayes network, belief network, decision network, Bayes(ian) model or probabilistic directed acyclic graphical model is a probabilistic graphical model (a type of statistical model) that represents a set of variables and their conditional dependencies via a directed acyclic graph (DAG). Bayesian networks are ideal for taking an event that occurred and predicting the likelihood that any one of several possible known causes was the contributing factor. For example, a Bayesian network could represent the probabilistic relationships between diseases and symptoms. Given symptoms, the network can be used to compute the probabilities of the presence of various diseases. In artificial intelligence, an evolutionary algorithm (EA) is a subset of evolutionary computation, a generic population-based metaheuristic optimization algorithm. An EA uses mechanisms inspired by biological evolution, such as reproduction, mutation, recombination, and selection. Candidate solutions to the optimization problem play the role of individuals in a population, and the fitness function determines the quality of the solutions (see also loss function). Evolution of the population then takes place after the repeated application of the above operators. Computer vision is an interdisciplinary scientific field that deals with how computers can be made to gain high-level understanding from digital images or videos. From the perspective of engineering, it seeks to automate tasks that the human visual system can do. Artificial intelligence applications have been used in a wide range of fields including medical diagnosis, stock trading, robot control, law, scientific discovery and toys. However, many AI applications are not perceived as AI: "A lot of cutting edge AI has filtered into general applications, often without being called AI because once something becomes useful enough and common enough it's not labeled AI anymore." "Many thousands of AI applications are deeply embedded in the infrastructure of every industry." In the late 1990s and early 21st century, AI technology became widely used as elements of larger systems, but the field is rarely credited for these successes. Deep learning (also known as deep structured learning or hierarchical learning) is part of a broader family of neural network methods based on convolutional neural networks (CNN)s. Learning can be supervised, semi-supervised or unsupervised. The Chinese room argument holds that a program cannot give a computer a "mind", "understanding" or "consciousness", regardless of how intelligently or human-like the program may make the computer behave. The argument was first presented by philosopher John Searle in his paper, "Minds, Brains, and Programs", published in Behavioral and Brain Sciences in 1980. It has been widely discussed in the years since. The centerpiece of the argument is a thought experiment known as the Chinese room. The appropriately programmed computer with the right inputs and outputs would thereby have a mind in exactly the same sense human beings have minds. 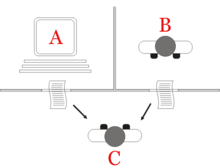 The "standard interpretation" of the Turing test, in which player C, the interrogator, is given the task of trying to determine which player – A or B – is a computer and which is a human. The interrogator is limited to using the responses to written questions to make the determination. The Turing test, developed by Alan Turing in 1950, is a test of a machine's ability to exhibit intelligent behavior equivalent to, or indistinguishable from, that of a human. Turing proposed that a human evaluator would judge natural language conversations between a human and a machine designed to generate human-like responses. The evaluator would be aware that one of the two partners in conversation is a machine, and all participants would be separated from one another. The conversation would be limited to a text-only channel such as a computer keyboard and screen so the result would not depend on the machine's ability to render words as speech. If the evaluator cannot reliably tell the machine from the human, the machine is said to have passed the test. The test results do not depend on the machine's ability to give correct answers to questions, only how closely its answers resemble those a human would give. ... that Prisma uses a neural network and artificial intelligence to edit pictures? ... that data from Media Bias/Fact Check was used to train an artificial intelligence machine learning algorithm to identify fake news? Do you have a question about Artificial intelligence that you can't find the answer to? For editor resources and to collaborate with other editors on improving Wikipedia's Artificial intelligence-related articles, see WikiProject Artificial intelligence. The word "robot" itself was coined by Karel Čapek in his 1921 play R.U.R., the title standing for "Rossum's Universal Robots"
This page was last edited on 12 April 2019, at 10:01 (UTC).